It was hot enough Friday that Seattle road crews had to soak the steel-decked bridge in water, so its drawspan leaves wouldn’t bind. For the third day this week, the University Bridge needed a midafternoon water bath to prevent its steel drawspan leaves from overexpanding in extreme heat. The center space between the two decks becomes so thin — only two-tenths of an inch after a couple of 80-plus degree days — the decks might grind against each other, while opening and closing for tall boats. 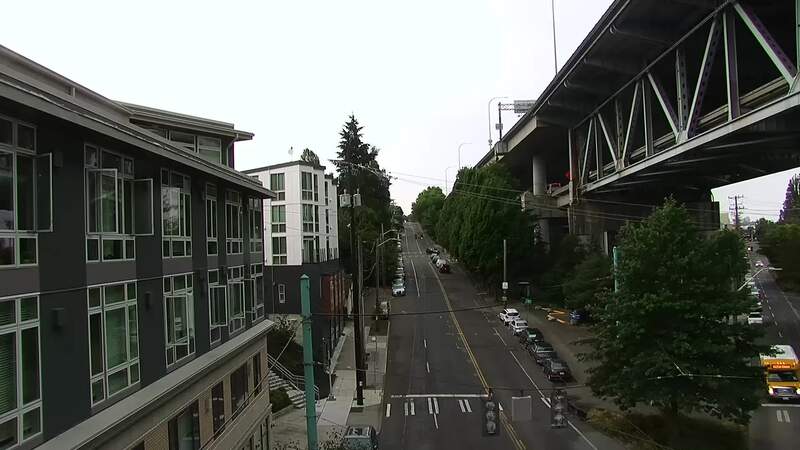 “Because of the bridge gap, you want both leaves of the bridge to be able to close properly,” said Norm Mah, Seattle Department of Transportation (SDOT) spokesman. A crew from the city’s Urban Forestry division showered the decks by spraying water from a truck around 2 p.m. Friday, after doing so Tuesday and Wednesday. They skipped Thursday because the sky was so polluted by forest-fire smoke from British Columbia that the haze held temperatures down a few degrees. The temperature at 3 p.m. Friday was 91 degrees at Boeing Field, the National Weather Service reported. In general, if the high is 90 following an overnight low that’s above 65 degrees, SDOT expects to shower the bridge, Mah said. A high above 85 prompts technicians to consider cooling. SDOT takes about 10 minutes to stop traffic and run its water truck back-and-forth on the deck. Crews use ordinary Seattle Public Utilities water, fortified with vitamin C — to neutralize chlorine from the city water system, so it won’t harm fish. “Aquaculture and aquarium hobbyists use vitamin C in water to help keep fish healthy,” says a fact sheet from the U.S. Forest Service. 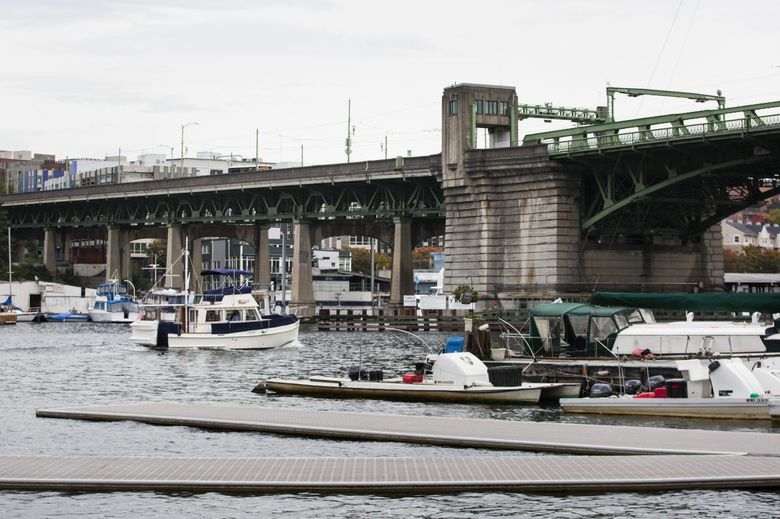 The 100-year-old bridge was built in 1917, the same year the ship canal and Ballard Locks opened to form a boat passage from Puget Sound to Lake Washington. On an average, 51-degree day, the gap between decks is a half-inch, Mah said. Seattle also operates the Ballard and Fremont bridges, while Washington state owns the Montlake Bridge. More dousings are possible, as temperatures between 85 and 90 are forecast until next Friday. And if salmon can endure warm waters in their migration toward Lake Washington, they won’t need to fret about chlorine or scurvy.